Today I found out a Coffee bean is not actually a bean, rather it is a seed. Now I know you are saying to yourself right now, “Aren’t beans seeds and seeds beans?” Surprisingly, that is not the case. (who knew?) In fact, though beans are always seeds, seeds are not always beans. A bean is just one kind of a seed. Specifically, it is a name for seeds of the family Fabaceae (also known as Leguminosae) of which the coffee plant is not a member; thus, coffee “beans” are not actually beans. The coffee “bean” is actually the seed of the coffee plant, the pit inside of the coffee fruit. Almost all of the world’s coffee is grown between twenty five degrees north and twenty five degrees south of the equator. The appropriate temperature for coffee to grow is between 60 degrees Fahrenheit and 70 degrees Fahrenheit. For high quality “beans”, Coffee should be grown at high elevations. The less oxygen in the air allows the tree to mature for longer. Once a coffee tree has bean planted, it takes about five years until it can be used for a crop. Coffee trees that are well shaded or grown in doors with little sunlight produce higher quality coffee, because it takes longer for the fruit to ripen. Coffee is the world’s second largest commodity after oil. Some of the world’s most powerful business, including Lloyds of London and the New York Stock Exchange, started out as coffee houses. On average 1.4 billion cups of coffee are drunk a day. Putting coffee grounds into ailing houseplants’ soil will help revitalize the plants. 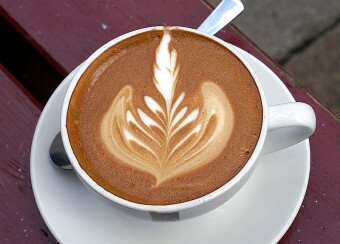 The average annual coffee consumption of an American adult is 26.7 gallons or about 400 cups. Coffee, taken black with no additives, is naturally a zero calorie beverage. The term “cup of Joe” stems from American soldiers in World War II, “G.I. Joes” were known to consume a large amount of coffee, as Maxwell Instant Coffee was included in their rations. The only American regions to produce coffee are Hawaii and Puerto Rico. One acre of coffee trees typically yields about 10,000 pounds of coffee fruits, which comes out to about 2,000 pounds of coffee “beans”. The term “SEED” used in your article is not correct, therefore what the article says is confusing. It is known that each berry usually contains two SEEDs but 5-10% of the berries have only one SEED and these are called perberries. I understand that many people outside the Navy think it’s just a theory, but “Cup of Joe” was coined by sailors. It was Admiral Josephus Daniels, who was Secretary of the Navy. In June, 1914, he banned all U.S. Navy ships from serving alcoholic beverages. Since Josephus Daniels was the one responsible for banning alcohol and “forced” everyone to make the switch to coffee, the sailors nicknamed the drink after him, thus it became “a cup of joe,” Joe being short for Josephus. You can speculate all you want about the theory, but that’s the one most widely told and accepted.